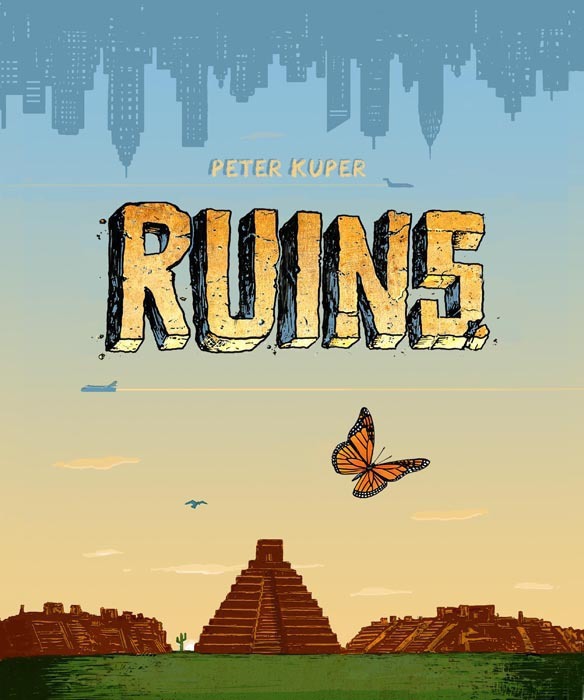 Peter Kuper’s Ruins is a magnificent graphic novel, the best I’ve read this year. I’d call it his masterpiece, but Kuper has already proved himself a master. Ruins succeeds on so many levels: great graphic art; remarkable storytelling, and stunning production values. 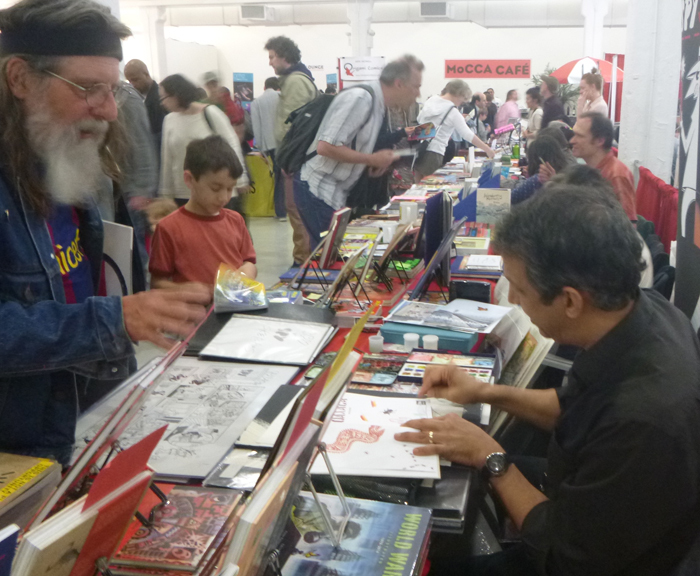 Peter Kuper adding a watercolor sketch to his signature for a fan at MOCCA. I’ve met Peter Kuper a few times. 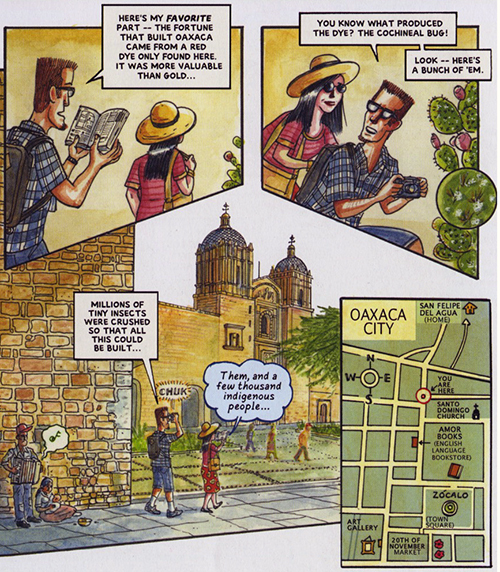 In 2007, I was honored when he contacted me to identify Mexican graffiti for his graphic memoir, Diario de Oaxaca: A Sketchbook Journal of Two years in Mexico. I invited him to talk to Kutztown University illustration students. We were thrilled he took the Bieber bus to Kutztown for the modest fee we offer guests artists. Students knew his work from Spy vs. Spy for Mad Magazine. He shared his unique illustration technique for adding tone to black and white images. He called it “poor man’s airbrush” – using cans of black spray paint with paper and tape friskets. He warned students that even wearing a protective painter’s mask one loses brain cells to the technique. He joked he was living proof, and that his memory lapses were not the result of recreational drug use, but paint fumes. Seeing a few pages out of context, I didn’t realize what a massive project Ruins was meant to be. I was impressed by what I saw, but presumed Ruins was going to a ‘floppy’ comic, 32 pages stapled together. I was completely blown away by the finished book. It weighs in at 328 pages. It was an embossed cover, impeccable printing, panoramic fold-out pages and a black satin ribbon bookmark, the sort one finds bound in missals. The story is multifaceted. Woven tight as Oaxacan tapete, Ruins weaves together romance, grief, politics, migration, ecology, and lessons in Mexican history. Detail from Ruins based on the Codex Mendoza. © Peter Kuper. I am sucker for movies set in exotic locals. Our hero races through the foreground. The eye-candy background is ‘the other.” Foreigners are interchangable secondary elements – villains and bombshells with accents thick as mud. We chase across the rooftops of Istanbul or Havana, or both. It doesn’t matter, as long as the locale exudes ‘otherness.’ Movies tend to offer meager social context and no entry into the deep cultural histories of place. Great books, such as Ruins, can do more. Kuper does something quite amazing in Ruins. He successfully integrates his understanding of the culture of Mexico, -Oaxaca in particular, into his story. He has spent years in Mexico and it shows. He riffs on Malinche, Diego Rivera’s Rockefeller Center mural, machismo, and mescal. At times you can see the gears moving, but, by and large, Kuper somehow manages to advance the central story with grace and ground it all in the cultural geography of 21st century North America. 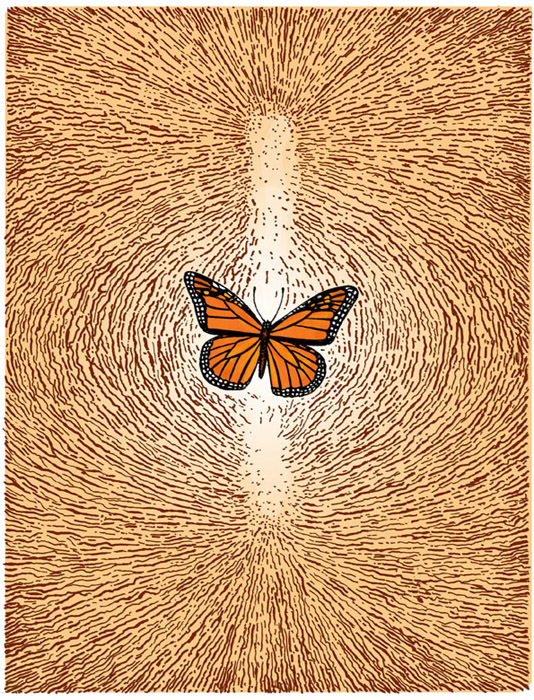 Taken alone Kuper’s suite of drawings of the Monarch butterfly’s annual migration could be a stunning book in itself. He is not the first to use the Monarch as a graphic metaphor for open migration and the unnatural concept of borders. Oakland’s Dignidad Rebelde and Pittsburgh’s JustSeeds have published posters in a similar vein. 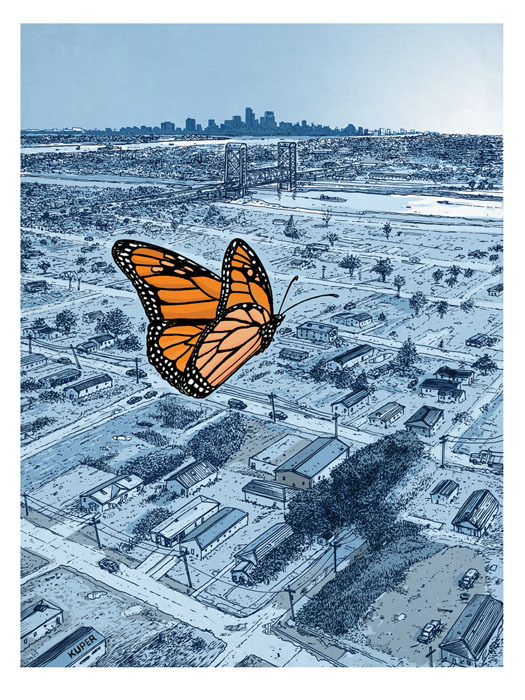 But Kuper composes a lyrical visual essay on the Monarch. It is a spectacular display of graphic art. Ruins is one extraordinary book. I am putting my copy on the same shelf with other great literary works about Mexico, Jessica Abel’s La Perdida and Graham Greene’s The Power and the Glory. 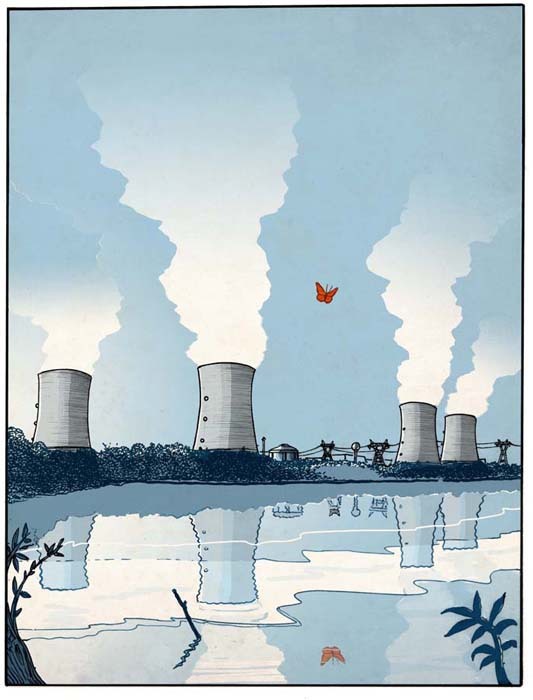 Ruins will be published this month (9/2015) by SelfMadeHero, London. Note by Kevin McCloskey. Speaking of Oaxaca: I am teaching a course for Kutztown students there in January. 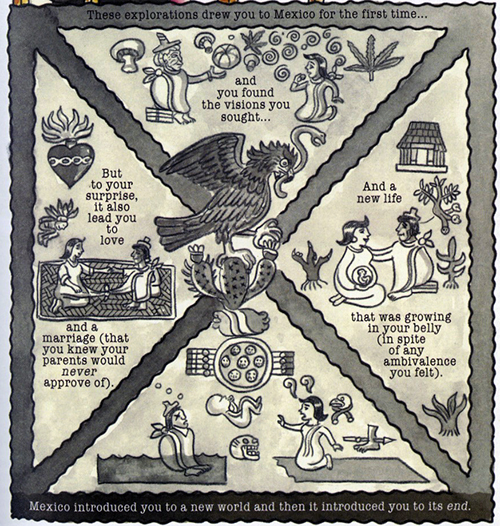 Also teaching a printmaking course, open to the public: Jan 10-15, 2016 through Oaxaca Cultural Navigator. Course includes an exhibition opportunity. More info here. Or drop me a line at mccloske(at)kutztown.edu. < Previous Not that Nathan Hale, Meet the Cartoonist.